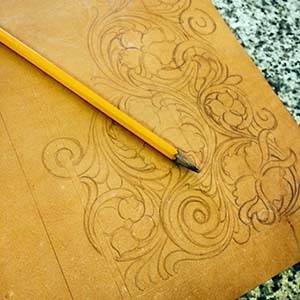 In this video, I show you my oiling and antiquing process for tooled leather projects. The finish that I did on this piece is what we call a “Light Oil Antique” and it is one of our most popular finishes in the shop. We have created previous videos on antiquing and oiling, but this video dives in a little deeper. Here are links to those two previous videos if you want to check those out. This is a Bonus Video to our Tooling Series videos that we created. In the tooling series, we walked you through my tooling process step by step showing the tools and techniques to accomplish this floral pattern. If you haven’t seen those videos, CLICK HERE to a post we created on our blog with all four of those videos all in one location. If you want to tool this pattern along with us, then CLICK HERE so that you can get your copy of the Free Pattern to print and use. There is also a link in the above mentioned blog post. Thank you so much and be sure to hit that subscribe button!